How do I repeat data like the above column in Excel without having to manually cut and paste? If this is not clear I will attempt to clarify. If you click on a cell, in the bottom right of the cell is a black square. When you click on the square, drag it vertically or horizontally, and let go, Excel will autofill the cells in the range depending on your selection. There are a couple of ways to get all of the information filled down that you require. Highlight the whole thing and drag the autofill button down. Enter the rest of the data in column 2. Highlight numbers 1 and 2 in first column and double click the autofill box (or you can drag down). This will fill until the last Data entered in column 2. 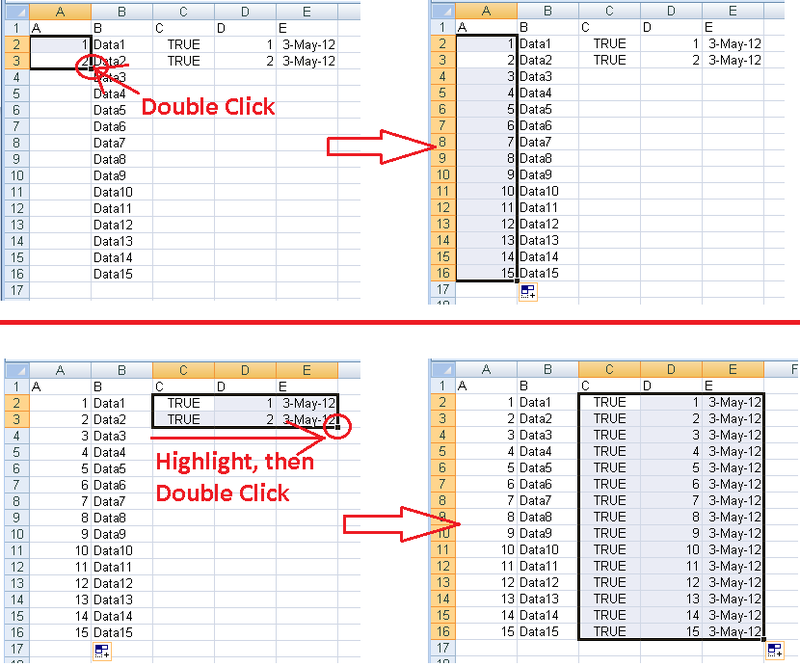 Highlight from True to 3-May-2012 (C1 to E2) in the first 2 rows and double click the autofill box (or drag down the box). 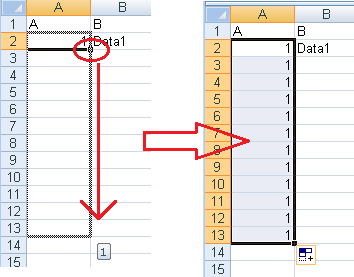 Again, this will fill until the last Data entered in column 2.
select the cell where you have entered the data already, move your mouse to the bottom right-corner the mouse will change to a cross, then click and drag to the bottom or to the many cells you want to auto fill or you can click & drag vertically. Not the answer you're looking for? Browse other questions tagged microsoft-excel microsoft-excel-2007 or ask your own question. Why does cutting a cell in Excel not work properly? How do I expand columns of items in Excel so that each item is on its own line?